The Hotel Chateau Frontenac is THE PLACE to stay in Quebec City. Its history, exceptional service and location make it an ideal home base for exploring the old town of Quebec. It’s fairly pricey which is why we only stayed one night, but it’s totally worth it in order to get the full Quebecois experience. The Chateau Frontenac is situated on top of Cape Diamond making it a beacon for all of Quebec City. Because of this, it’s widely regarded as one of the most photographed hotels in the world. Whether you’re right in front of the building looking up or it’s peeking between buildings from afar you can get a good shot of its towering presence. We stayed at a Hilton that was a couple miles away and we could still see the Chateau, lit up with red and green lights for the holidays, from our window. Not only does it have a strong visual presence due to its size (clocking in at over 600 rooms) but the building looks more like an ancient castle than a hotel. Built in 1833, it was originally conceptualized to be a hotel to promote the luxury train travel of the Canadian Pacific Railway. The strong diagonal levels of roof and different wings with towers and turrets make it look like Harry Potter’s Hogwarts Castle. It’s dramatic upward lighting at night gives it a captivating and incredibly striking appearance. Alfred Hitchcock even shot his movie, I Confess, in the hotel in 1953. Inside, the building is a bit of a maze due to additions being added over the years. We took a stroll to the indoor pool and workout facility and decided the take the stairs back up to our room on the eighth floor. We ended up on a staircase that stopped at the fourth floor, went into a different staircase that only went up one more floor then finally found an elevator and realized we were in the wrong wing of the hotel. From that point on we stuck to one set of elevators that opened near the check-in desk. The lobby of the hotel is constantly bustling from early morning to late at night. There are three restaurants and a Starbucks on the property as well as an art gallery and shopping. I was able to pick up a heavy wool scarf from Lambert and Co, a local winter accessory boutique, without even walking outside. That scarf ended up saving my nose and face from frostbite for the rest of the trip. Complimentary hot chocolate is also available in the evenings near the elevators. The tasteful holiday decorations and lights throughout the first floor and the hardwood accents and chandeliers make you feel like you're walking through a winter wonderland fit for royalty. The biggest perk of the Chateau is its location. To get to the adorable Old Port below, you can take a $3 CAD funicular (or tram) ride, which has a station right outside the hotel. Or take a set of winding stairs down to explore. 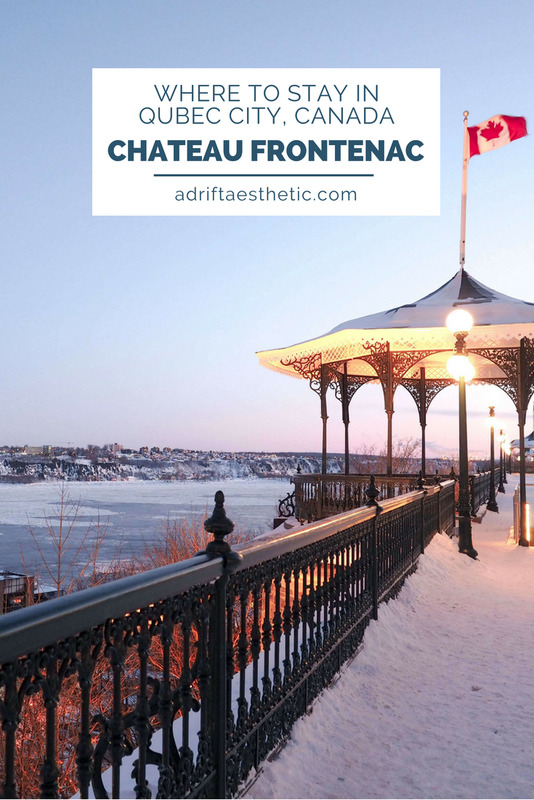 The Chateau Frontenac also has its own toboggan slide providing outdoor fun in the snow without having to travel far from the city to a ski resort. The Hotel is also the center of most of the guided tours in town and their concierge services can hook you up. We rented a car to get to all our stops outside of the city but most are accessible by tour bus as well. Another plus to staying here: everyone can see the stunning views. Most hotels don’t have windows in the hallways so to get a picturesque view from a higher floor you have to luck out with a good room. However, we were able to capture our best pictures of the St Lawrence River from the hallway windows across from the elevators! As the most prominent building in the Quebec City skyline and having been home to such prominent figures as Charlie Chaplin and Queen Elizabeth II, the Chateau Frontenac is a must stop. Rated one of the best hotels in Quebec City, you'll feel like a celebrity as soon as the bellhop takes your bags in the lobby. As you walk through hallways filled with history and glamour, you'll feel like you've been transported in time, making your Quebec vacation even more special.